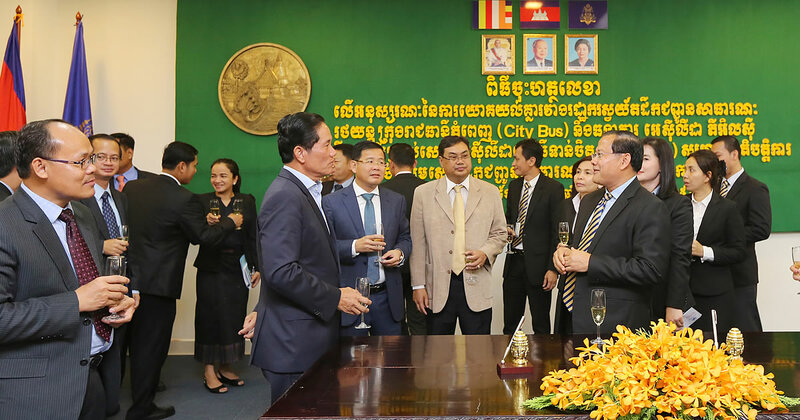 Phnom Penh, August 23, 2018, ACLEDA Bank Plc. 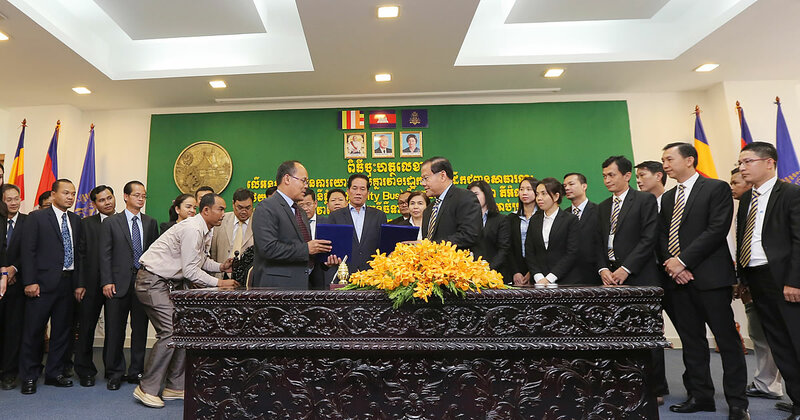 "The Bank You Can Trust, the Bank for the People", and the Cambodia's leading commercial bank, has announced today that the Bank signs a Memorandum of Understanding with Phnom Penh City Bus Authority using ACLEDA Unity ToanChet as a means of fee payment for public city bus and ferry, under the Presidency of H.E Khuong Sreng, Governor of Phnom Penh Municipality. Dr. In Channy, President & Group Managing Director of ACLEDA Bank Plc., said that ACLEDA Bank Plc. is delighted that Phnom Penh City Bus Authority selects ACLEDA Bank Plc. as a partner for settlement of public city bus and ferry fees through ACLEDA Unity ToanChet. By using ACLEDA Unity ToanChet, the passengers of either city bus or ferry can quickly make their fees payment conveniently and automatically via ACLEDA QR Code in the bus and the ferry. The ACLEDA Unity ToanChet is a digital mobile banking product run by Android and iOS for payment and purchase of all kinds of goods and products everywhere through ACLEDA QR Code conveniently, securely, and quickly. Currently, there are 624,684 users and 7,024 partners registered for ACLEDA Unity ToanChet. 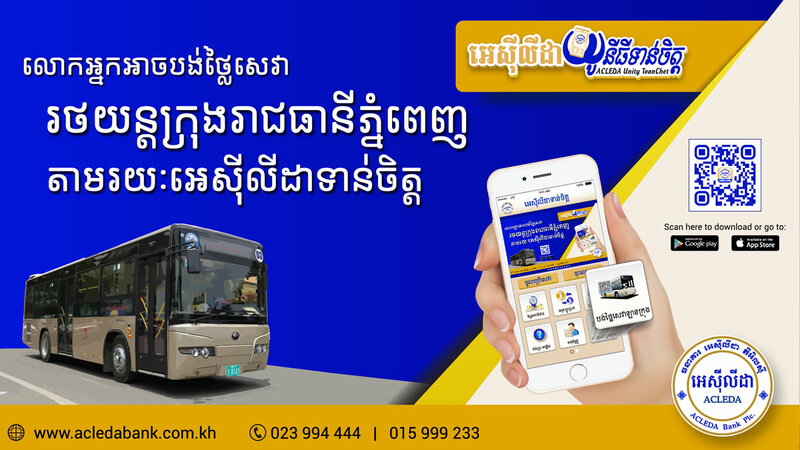 Mr. Ean Sokhim, Director of Phnom Penh City Bus Authority, said that using ACLEDA QR Code is convenient to manage revenues, passengers data, and provides the city bus and ferry passengers with most convenient means for fee payment quickly, it helps facilitate their daily commute without any delay, save time. They can travel comfortably, safely, reduce expenses and reduce traffic jam, of course it helps reduce traffic accidents in accordance with policy and value advice of the government under the leadership of Samdech Techo Hun Sen.
Phnom Penh City Bus Authority has 155 buses running 8-lines of city bus which is popular choice for commuters. Currently there are 20,000 to 21,000 commuters per day. It also has one waterway transportation service from Russey Keo Station to Takhmao Station. ACLEDA Bank Plc. has 5 subsidiaries, they are ACLEDA Bank Lao Ltd., ACLEDA Securities Plc., ACLEDA Institute of Business, ACLEDA MFI Myanmar Co., Ltd. and ACLEDA Properties Ltd., as well as representative offices in the Republic of the Union of Myanmar. By July 2018, the Bank's total assets, loans and deposits were 5.43 billion US dollars, 3.25 billion US dollars, and 3.48 billion US dollars respectively. It also had over 2.5 million customers using its products and services. EVP & Group Chief Operations Officer, ACLEDA Bank Plc. EVP & Group Chief Legal Officer and Corporate Secretary, ACLEDA Bank Plc.